In the early 70’s I drove a tractor-trailer, in my early 20’s and raised in the agricultural based economy of SW Florida I loved the independence of driving, it was a good fit. Ft Myers Farmers Market to the largest cities of the Midwest and Eastern Coast – Fla to Boston, Philly, NY, Chicago – and more. Border to border, experiencing a little of Mexico and Canada along the way. While doing this I ‘lived’ in the truck 24/7 for three of those years as the crop moved northward. So understand that whenever the opportunity arose to visit my apartment at the time (I was paying for one), “partying” with the same group of buddies was at the top of the activity list. Al, Dewey, Dowdy, Hobbs, and Locke were the core of my friends in this era. We shared a number of kindred experiences in the same frame of mind; good years. The ‘rabbit’ experience happened one night along the lonely stretch of highway; Alligator Alley. Driving and delivering those distances, “lay-overs” occur when you arrive at a destination too late in the business day to unload. Weekend Lay-overs many miles from home did happen on occasion and was a great opportunity to rest-up from the long hours of driving, when further from a party-zone.. Being only a few hours away from ‘home’ (and my friends), well…… – it was an easy choice. – ‘festivities’ with the friends began, any reason would do. Somewhere during this weekend we ALL decided to return in the truck to the East Coast to help unload and then retrieve my trailer. By unloading the trailer, they each split the $30 bucks for unloading; and we would be home by Monday afternoon. It wasn’t unusual for a single friend to take a road trip in the truck, but on this Sunday – four friends were eager to tag along. Sunday evening we all climbed into the cab of the truck (two front and three sitting in the ‘sleeper’) and began our journey into and across the darkness of the everglades. Once again, there were five of us in the cab of this truck and before this trip was over we would indeed be glad that each were present. Our trip began as normal as could be expected for five twenty year old boys working through a 70’s party binged weekend. 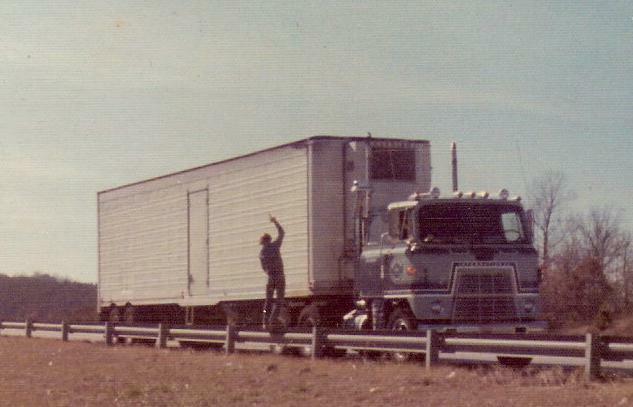 At that time our weekends seemed pretty much “wide open” so there nothing unusual nor extraordinary about us from any other young adults of the time – except at the moment there were five of us in the cab portion of this semi; music blaring, laughing and carrying on through the lonely Florida night. We maneuvered safely across the state; laughing while absorbing the miles of palmetto fraught highway. Past Immokalee we moved further into the dark and eerie Everglades – in the early seventies this was a lonely stretch of road. ‘Alligator Alley’ at the time was a very straight and lonesome two-lane stretch of highway crossing the marshland of the south Florida terrain. It was not unusual to slow for a “gator” and/or to exercise caution in avoiding the occasional opossum, raccoon, or armadillo; it was ‘a just part of’ this highways swampy setting. As we rode, it wasn’t long before we began to notice a rabbit or two – nothing out of the ordinary except that soon there were smaller groups of these rabbits – on the highway! Now this was becoming a little ‘different.’ As another ‘party-favor completed its journey around the cab; those little groups of rabbits became more and more frequent – causing comment to arise of whether this was real or simply the quality of ‘party favor’ we had just sampled. I slowed the truck to as best I could to avoid the little critters. Looking across to the other seat in the front of the truck anoher buddy Gnagey sat glaring into the windshield; the elongated reflections of movement reflected from the lenses of his thick glasses as stared onto the highway ahead – his mouth was agap in stunned amazement. There was no other traffic during this period and as I proceeded to use the entire roadway in avoiding the occasional critters – it was soon apparent that there was just no way to avoid it. ‘Thump, thump,’ and there went a few more – no way around it. We continued to nudge each other with absolute disbelief – Was this really happening? Soon those small groups of rabbits merged as a mass of movement before us – those long rabbit figures creating bouncing shadows ahead. We were in a ‘sea of rabbits,’ incredible, unbelievable! – and of course we stopped the truck! We were dumbfounded. Sure, the party-favors probably didn’t help but we were all seeing the same thing for sure! We climbed down out of the cab and onto highway, into the middle of this living mass. – and we waded around in disbelief, stoned delight, and utter amazement. Standing in the middle of the highway, in the middle of night, in a living mass of rabbitts!. This event was absolutely real. We climbed back into the truck and reluctantly moved ahead; allowing as many of the animals as possible to part in front of us out of harms way. After a few slow miles the mass of bouncing shadows thinned, then ended leaving us each to just stare at the remaining miles ahead. And yes, there was continual reassurance from each of what we had witnessed. Years later I remain amazed when I try to comprehend the hundreds of thousands of rabbits on the roadway that night. In our continued friendship over the years, the event always remained a principle topic of conversation when we gathered. We agreed also that whenever this event was shared with others; the story was met with a wall of skepticism – too improbable, no-way. For this reason, individual consensus became to avoid telling the story, and we only spoke of the experience when we gathered as a group. One day; one of these friends was having a conversation with a local businessman, the businessman reluctantly hinted of a strange experience that he had encountered while crossing the Everglades years earlier – on the very stretch of highway we had crossed. My friend (Dewey) noticed the businessman’s (Glen Foxx) hesitation in elaborating more. Then, with a few simple questions and statements from Dewey – indeed someone other than our small group of friends had encountered the same phenomenon – on very likely the same night! After so many years of withholding this unimaginable story from others; the two shared a common and very relieving laugh together. Dewey told me that the atmosphere was as joyous and quite similar to the reunion of finding a long-lost brother. ‘We’ had witnessed the event together, in a common vehicle, and met with utter frustration in repeating the story to others over the years, but as a group we always had each other to reassure. This poor fellow had traveled that stretch of highway alone and had met with the same frustrations in communicating the event to others over the years – I could only imagine his relief. Also this businessman had researched the event and attributed it to a drought in the Everglades which was followed by a series of large vegetation fires which he felt explained it. These fires had driven the rabbits into groups and then massed them onto the only high ground around in the area – the highway. Needless to say, unloading and retrieving my trailer was much less eventful. As friends we returned to our homes, apartments, and remain much closer from the extraordinary (and very real) experience of that night. We had witnessed a living sea of rabbits, it was incredible! “So, over the years I had told my Alligator Alley story several times. I’d just assumed it was an annual occurrence, but had never heard or read anything similar to it until today. Over the past 20ish years, I’d actually Googled it at least 2 or 3 times, certain to find at least some mention of it…again, with zero results, until today. I didn’t recall the exact date, or even year, but when I read your timestamp of Sept 1974, everything came into perfect alignment. It was the summer of 1974, my cousin Tony and I had just graduated high school and decided to roadtrip down to Florida in his new, hopped up Nova SS. There are several stories within stories made during that trip, but it was only that night we crossed Alligator Alley that I’d ever Googled. I remember us arriving late at night, traveling from the gulf coast, east, heading to Fort Lauderdale. It was late, we’d never heard of the Alley, and the several ominous posted signs warning us to make certain we had plenty of gas, and not to stop or get out of your car, created measurable anxiety. Of course, my 18 year old cousin’s strategy, in full agreement with his 18 year old knucklehead cousin (me), was to make the Alley trek at high speed. After all, it was the middle of the night, there were no others cars to be seen in this most desolate place, plus the numerous posted warning signs… coupled with 2 teenage jugheads driving a mid 70’s muscle car…a high speed run of it was the only logical conclusion. We decided our 1/2- 3/4 tank of gas was gonna have to do, and Tony spooled the Nova up to speed. Of course, within minutes we totally freaked out! Thud, thud, whack! What’s going on?! Thud, whack, thud. Am I seeing what I think I’m seeing? Whack, thud, thud. How is this possible? Thud, thud, whack! We have to stop and try to figure this out! This is insane! By the late hour we arrived at the Alley, it was literally covered with rabbit fur. Hundreds of thousands, possibly millions of tiny bunny dots overcoated the road, smashed by all of the earlier adventurers. This was nuts! We got back in and tried to proceed normally, but of course, there was nothing remotely normal that night. The tiny bunnies dove at the car lights and were smashed in a blink. We couldn’t even see them it’d happen so fast. They just darted from the roads edge, into our path, in what seemed like a steroid induced hyper suicide pact! It was impossible to drive and not flatten bunnies by the hundreds! What are we going to do? The countless posted signs warning us “Do Not Stop”, “Do Not Get Out of Your Car”. How’s our gas gauge now? Not great! Holy Crap! Anyway, we somehow got across that desolate stretch of Death Bunny Alley, probably somewhere around 2:30AM, with that crazytrain experience burned into our memories forever.